billage is a cloud based CRM, task management, accounting and client billing solution for freelancers, micro-enterprises, startups and small businesses. The solution can be used to manage the entire sales process, from the initial generation of a business opportunity to closing the deal and collecting payment. billage incorporates graphics and real-time alerts to provide users with constant updates on the status of sales and tasks. billage facilitates communication between team members and enables the automation of repetitive tasks to increase productivity and enhance performance. Billing management features include order, estimate, and invoice creation, delivery notes and templates. billage supports administrative and fiscal management, remittances, and tax settlements. The software is accessible to users on iPad & iPhone devices, is available as a Google Chrome plugin and thanks to IBM technology, is backed up every two hours. Many useful tools (budgets, invoices, crm) for little money. A great success! Control over charges and payments View real-time status of my company's finances State of each client and next action to be taken on the client Bank remittance management A calendar as easy to handle as google calendar and synchronized with the own tools SOFTWARE: good manager of clients with their tasks, budgets or invoices synchronized with a calendar view that facilitates the work. Very useful control panel for the visual composition of your own statistics. Essential for managing your company's data and making decisions. Charges and payments manager. TECHNICAL SUPPORT: Always available to solve your doubts or problems. The best of Billage. PRICE: Very economical tool for everything it offers. Ideal for startups. NEW DEVELOPMENTS: New tools usually appear that improve or complement the usual ones. Billage does not stop growing in functionality. CLOUD: All tools on cloud for accessibility from anywhere. FORUM: Forum where they listen to your needs and the other users can vote if they also need that development. SOFTWARE: good manager of clients with their tasks, budgets or invoices synchronized with a calendar view that facilitates the work. Very useful control panel for the visual composition of your own statistics. Essential for managing your company's data and making decisions. Charges and payments manager. TECHNICAL SUPPORT: Always available to solve your doubts or problems. The best of Billage. PRICE: Very economical tool for everything it offers. Ideal for startups. NEW DEVELOPMENTS: New tools usually appear that improve or complement the usual ones. Billage does not stop growing in functionality. CLOUD: All tools on cloud for accessibility from anywhere. FORUM: Forum where they listen to your needs and the other users can vote if they also need that development. Sometimes it takes a little longer than expected to activate tools with agreed dates. Although that happens to us all, right? Hi, My experience is , in general, positive. But there are several things to improve. You can enjoy a easy sofware , if you are a small company, and with a very good price. easy to use and with a very good price. Easy the moving ammong pages and sure answer from internet if you have to in. easy to use and with a very good price. Easy the moving ammong pages and sure answer from internet if you have to in. You can't modify the grafic part of invoices/budgets/etc. you can't make filters to organice better final resolts, delivery notes, specially if you do diferent kinds of work. How do you organize at the end of the month, if you have several jobs in the same invoice or delivery notes? You can't change "delivered or not" by groups, only one per one. Billage help us to organize our tasks, now we have a better control of the projects and tasks, managing these projects with billage makes them easier for us and everything is figure out. Specially for me as a team manager, I could review tasks, commercial activity, invoices...anywhere, anytime and online.The evolution, I started to use it 2 years ago and I realize they're constantly improving the app, adding more features and redesigning a new UI faster and friendly. I didn't expect nothing less than perfection from the last version and they fulfilled my expectations once more. The evolution, I started to use it 2 years ago and I realize they're constantly improving the app, adding more features and redesigning a new UI faster and friendly. I didn't expect nothing less than perfection from the last version and they fulfilled my expectations once more. I'd like to improve the dashboard adding more options that let users customize not only the elements available on the welcome screen, however the elements itself. Just some details like: 1. The way it deals with rounding amounts 2. The way it keeps users preferences But developers are already working on all this! I like very much as a work tool that unites all departments in such an agile way and at the same time accept continuous suggestions from users. I do not like not being able to customize the welcome screen and that I always appear something that I hardly use, I would like to be able to customize it. On the other hand they should warn of the updates with more time, lately warn when they are already implemented. As a cloud based application, billage makes all client, task and billing information available to users at any time, from anywhere. CRM features enable users to view all client information (including contact information, past purchases, meetings, etc.) at a glance. Tasks can be assigned to team members and their progress, time spent on tasks and expenses can be monitored. billage automatically warns users when tasks are due and helps to ensure comprehensive follow-up on potential clients, increasing the chance of success for sales teams. billage analytics features include tools for performing profitability analysis. Below are some frequently asked questions for billage. Q. What type of pricing plans does billage offer? Q. Who are the typical users of billage? Q. What languages does billage support? Q. Does billage support mobile devices? Q. 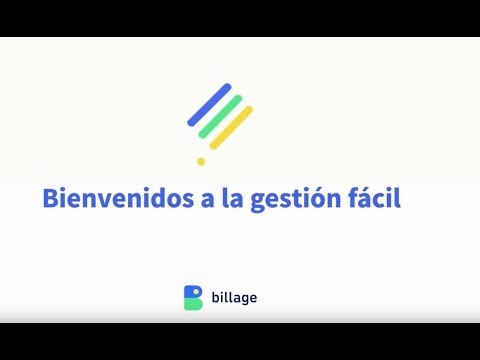 Does billage offer an API? Yes, billage has an API available for use. Q. What other apps does billage integrate with? Q. What level of support does billage offer?